Terrifying violence in Myanmar’s Rakhine State has forced over 600,000 Rohingya people to flee from their homes and seek refuge in Bangladesh. A military crackdown on insurgence in the state has left innocent Rohingya families subject to unthinkable trauma—family members killed and homes and fields set ablaze. Forced from their homes with nothing, refugees—mostly women, children and the elderly—are pouring into a small region of Bangladesh and settling in miserable shelter conditions with little food, medical and sanitation services. 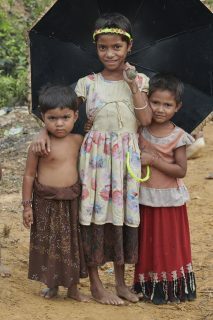 The Rohingya are in need of many necessities for survival. PWS&D, in partnership with members of the Canadian Foodgrains Bank, is responding by helping provide life-saving food assistance to 18,000 Rohingya people for three months.